SAALT is outraged by the Fifth Circuit Court of Appeals decision last night to block the expanded Deferred Action for Childhood Arrivals (DACA) and Deferred Action for Parental Accountability (DAPA) programs, key components of President Obama’s executive action on immigration issued last November. This follows the Fifth Circuit Court of Appeals decision in May to maintain the injunction on expanded DACA and DAPA issued by Judge Hanen of the Southern District Court of Texas in February. We hope this misguided decision does not discourage individuals from applying for the original DACA program that launched in 2012 and continues to be available. Over half a million young people have already benefited from DACA. SAALT is outraged that a second mistrial was declared on November 4, 2015 after a deadlocked jury once again failed to convict Madison, AL police officer, Eric Parker, on a civil rights charge brought against him by the U.S. Department of Justice earlier this year. Parker was captured on video beating Indian grandfather, Sureshbhai Patel, to the point of partial paralysis in February after Patel, initially identified by a neighbor as a “suspicious Black man,” repeatedly told the officer he could not speak English. The U.S. Department of Justice re-tried the case after the first mistrial was declared in September. “We continue to believe in the strength of the evidence and that the defendant’s actions violated the constitutional rights of the plaintiff,” said Bhavani Kakani, President of AshaKiran. 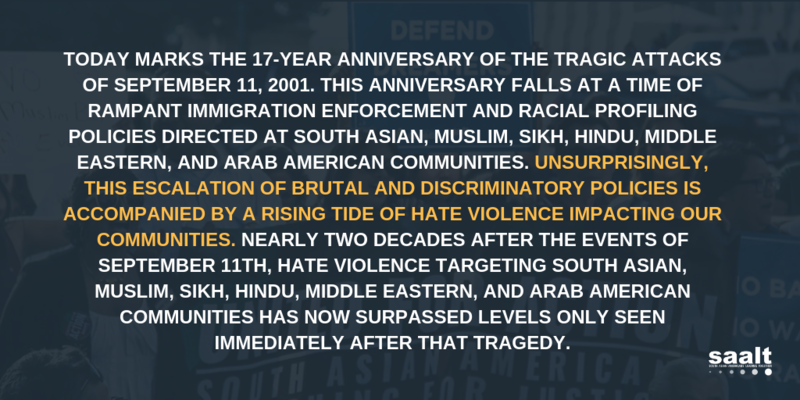 SAALT encourages South Asian Americans to be vigilant and engaged in the efforts of the movement for Black lives to draw attention to the ways in which Black communities in particular, as well as other communities of color, are facing state violence. “The case of Mr. Patel provides an opportunity for South Asians to become active participants in the demands of the movement for Black lives,” said Suman Raghunathan, Executive Director of SAALT.